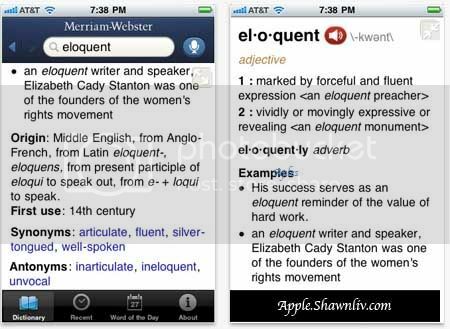 The free Merriam-Webster app brings America’s most useful and respected dictionary to your iPhone. #1 Free Reference App on the iTunes Store, 1/7/11. In addition to all the definitions from Merriam-Webster’s Collegiate Dictionary, the app offers voice search – to let you look up a word without having to spell it – along with synonyms, antonyms, example sentences, Word of the Day, and more. A great tool for reference, education, and vocabulary building.